Founded in 2010, iZettle is a Swedish card reader company trying to drag the payments industry into the 21st century. iZettle allows business owners to use your smartphone or tablet as a mobile point of sale device by pairing a small card reader. The card reader and app allow you to accept payments anywhere in the world so long as you have an internet connection. In this iZettle review, I’m going to dig down into what iZettle does and discuss what sorts of businesses will get the most out of the service. Let’s get started. We’ve partnered up with iZettle – one of Europe’s leading fintech companies. Right now, we can offer the iZettle card Reader for £25 + VAT for new iZettle users, click here to get yours now. 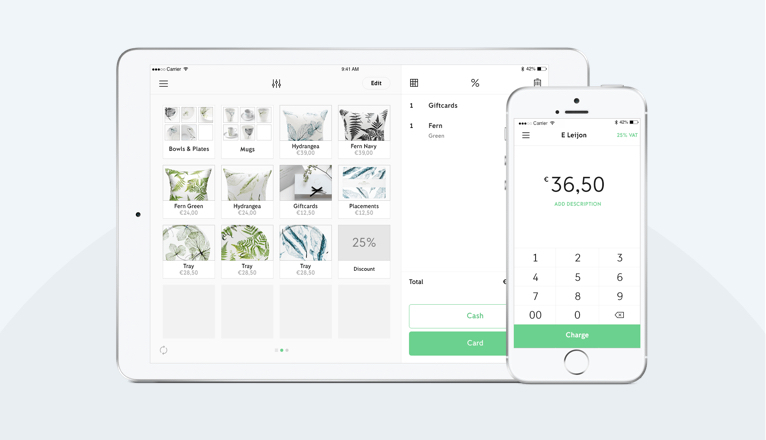 iZettle is a point of sale app that you install on a tablet or smartphone like an iPhone. The iZettle app works with an external card reader to process credit and debit card payments, allowing you to make mobile payments wherever you have an internet connection. The app supports a range of payment options, boasts powerful reporting software, helps with stock management and even integrates with accounting software like Xero. Using the iZettle Reader 2, you can accept payments using Chip & PIN, contactless payments and the magnetic strip. It even supports NFC payments like Apple Pay, Android Pay and Samsung Pay. iZettle works on a pay-as-you-go basis so once you pay for the card terminal, you only pay transaction fees when you process card payments. That means you’ve got no contracts and no minimum monthly fees to worry about. What iZettle products are available? 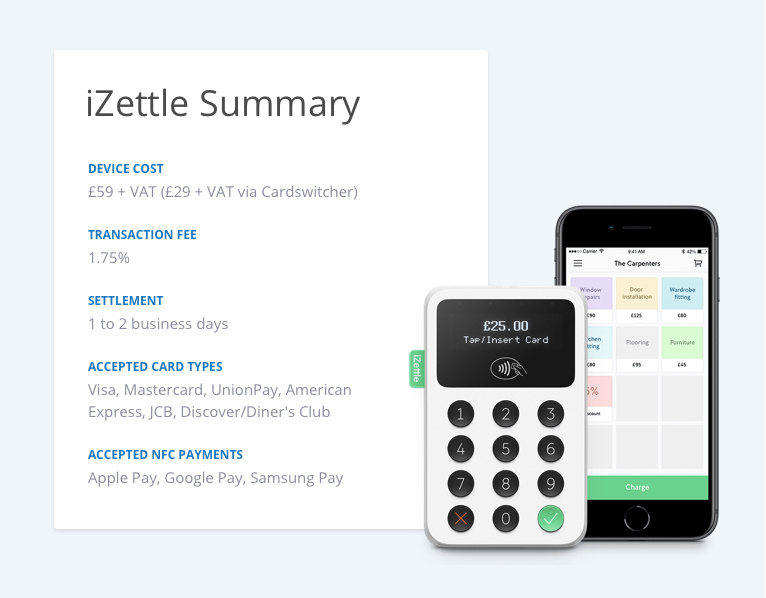 iZettle started off as a simple mobile card reader for microbusinesses and small business. Based on its success, iZettle rolled out a bunch of new products to position iZettle as a more serious player in the payment processing space. Nowadays, iZettle offers everything from a standalone card reader to full retail store kits. Store Kits: This bundles an iZettle card reader with a bunch of other stuff, allowing you to operate a fully functional, retail POS system without signing up to a full-service payment processor. Prices start at £259 for the barebones kit and go up to £729 for the all-singing retail setup. Stands and Docks: These let you mount your card reader or iPad to create a more professional (and safe) checkout. The card reader dock costs £39 and the stands start at £49. Cash Drawer: The iZettle app allows you to process payments with cash so it’s important to have somewhere to put it. The cash drawers are well designed and reasonably secure. Receipt Printer: iZettle offers a bunch of decent receipt printers, costing between £199 and £249. Card Reader: Last but not least, iZettle sells the iZettle Reader 2. The second generation card reader is one of the best on the market and is a good choice for most microbusinesses and many small businesses. Is the iZettle card reader easy to use? iZettle is designed to be easy to use by everyone and anyone. Just pair the reader with your mobile device and start accepting payments. From a customer’s point of view, the iZettle looks like a slightly techier card terminal. It’s sleek and small — a little larger than a credit card. It works with almost all credit and debit cards, including Visa, MasterCard, Visa Electron, V pay, Maestro, American Express, JCB, Diners Club and Union Pay. iZettle also accepts Apple Pay, Google Pay and Samsung Pay. The iZettle reader can process payments using Chip & PIN, contactless cards and magnetic stripe. How good is the iZettle App? The iZettle reader can’t process payments on its own. The reader only captures the card’s payment information and transmits it to a smartphone or tablet running the iZettle app. So when we’re talking about how good iZettle is, we also need to think about the app. The good news is that the iZettle app is extremely good! It’s available through Android‘s Google Play and Apple‘s App Store and is easy to use even if you don’t have much technical knowledge. The app interface is simple and uncluttered so it’s easy to navigate to the particular menu or option you are looking for. Setting up your business within the app is also fairly simple. You can create a product library, upload pictures, add descriptions, prices and so on directly from the app. The app even boasts some more advanced retail features like product variants and inventory control. Another great feature within the app is the reporting function which allows you to review daily and monthly transaction breakdowns. If you are data-minded, you can export in-depth reports too. How much does iZettle cost? A big consideration for any payment processing system is cost. Comparing fees with card readers is a little tricky as you have to compare them against two different types of products. First, other mobile card readers. Second, traditional rented card terminals. I’ll start by recapping what iZettle costs you then I’ll compare it to other card processing options to see how it stacks up. You can (currently) buy the iZettle card reader for £29 (excluding VAT) via iZettle’s website. This is a discounted price and the reader will normally cost you £59. The device is pretty robust but you will have to replace it every few years. The second and more important fee to think about is the payment processing fee or transaction fee. In other words, the percentage of each transaction that iZettle keeps as payment. 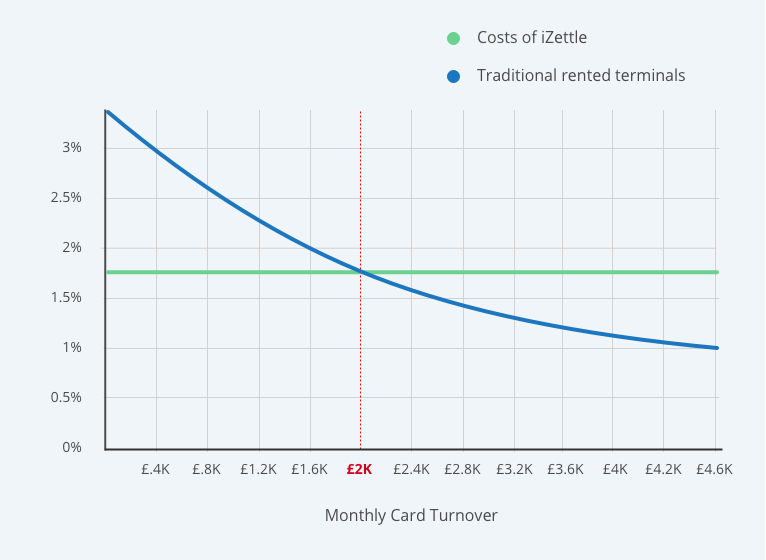 Previously, iZettle worked on a sliding scale where you were charged a lower percentage as your monthly turnover grew. The fee scale ranged from 1.00% to 2.75%. 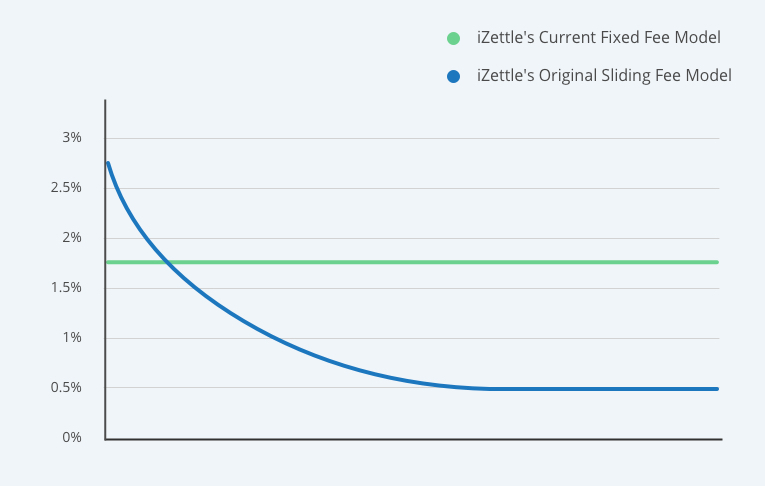 However, that all changed a few years ago when iZettle moved to a fixed percentage model. Merchants now pay a flat 1.75% transaction fee regardless of whether they take £100, £1,000 or £10,000 per month. While iZettle isn’t known as an e-commerce payment processor, its paid tier does include online processing. This is charged at a slightly higher rate of 2.5%. The beauty of card readers like iZettle is that you only pay the transaction fees. There’s no extra application charges, minimum monthly fees or PCI compliance checks. Just start selling and pay as you go. As I mentioned before, iZettle is really competing against two types of product: other mobile card readers and full-service payment processors. Let’s start by comparing iZettle to its direct competitors in the card reader niche. As you can see, the mobile card reader market is very competitive with very little between each product. While the iZettle is the most expensive device, it is almost always available at a discount by buying through an affiliate link like ours. You should also remember that the current iZettle is their second generation reader whereas other companies use third-party readers or are still on their first device iteration. It’s also worth pointing out that the Square device is only a card port and relies on a phone or tablet for PIN input. In the card reader niche, processing fees are all very similar. SumUp is the cheapest option for most merchants, charging just 1.69% per transaction. iZettle and Square charge a slightly higher fee of 1.75%. However, there’ only 0.06% between the services. PayPal Here is slightly different as it operates on a sliding scale from 1.00% to 2.75%. However, to get the cheapest rate from PayPal you must process between £15,000.01 and £25,000. At this volume of sales, it is likely you can get cheaper merchant services via a full-service payment provider. And that brings me to the second important comparison. The second comparison we need to make is with full-service traditional rented card machines. With this option, payment processing companies rent traditional card machines to merchants on long-term contracts with predefined minimum monthly payments. Because the deals last several years and include minimum charges, the actual processing fees tend to be much less. If you compare traditional rented terminals, it’s likely you can get your payment processing fees under 1.00%. Generally speaking, if you process more than £2,000 per month, you’re much cheaper ditching the mobile card reader and going with a rented card terminal. Is iZettle safe for my business? Whether you’re a brand new sole trader or a well established small business, payment security should be right at the top of your list of concerns. iZettle is compliant with PCI DSS (a security standard for handling card data) and is approved by EMV (Europay, MasterCard and Visa). In short, they take security very seriously. All iZettle‘s software is developed to follow strict industry-standard best practices and the card reader itself boasts a range of tamper-proof design elements. In fact, if the card reader detects someone trying to tamper with it, it will shut down and stop working. The public perception of card readers is also changing. While some people were initially reluctant to plug their card into a mysterious box connected to a phone, this is changing as people get more familiar with brands like iZettle and SumUp. The security behind iZettle is pretty impressive and would require its own blog to cover fully. If you’re interested in learning more, check out the security section on iZettle‘s site. How is iZettle’s customer service and support? When you rely on a device to accept payments, you need to know that support is there should you need it. With iZettle, all customers get access to phone support during office hours (9 am to 5 pm) and ticket-based email support. While the email support is good, I’d recommend using the phone support if you need an urgent or technical fix. In my experience, all the iZettle support staff I’ve dealt with has been knowledgable, helpful and equipped to resolve my issue. The iZettle website also has an in-depth support section with pre-written guides for the most common issues and problems. For basic problems, the support section is a good first stop. Should I use iZettle for my business? iZettle is a great choice for small businesses, microbusinesses, entrepreneurs and market traders. If you need a super simple POS paired with a tried-and-tested card reader, iZettle is definitely an option to consider. And it’s not just me that thinks so. iZettle‘s online reviews are positive across the board. Check out these reviews from TrustPilot, Capterra and GetApp. 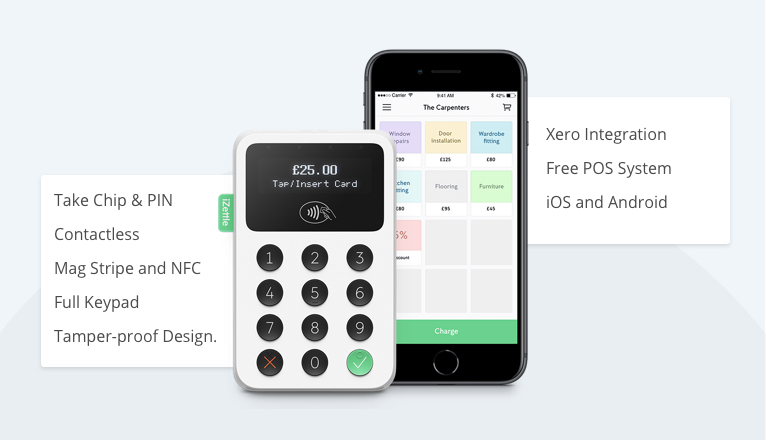 iZettle is a great choice for low volume businesses and if you process less than £10,000 per year, iZettle is reasonably competitive on price. However, it’s not for everyone and every business. If you operate from one location and you process more than £10,000 on cards every year, there are cheaper options available. Also, remember that you can’t take offline payments using iZettle so if your connection drops, you’ll be stuck asking customers for alternative payment. How do I sign up with iZettle? If you’ve reached the end of the article and you’re confident that you want to go ahead with iZettle, here’s your next steps. Purchase your iZettle card reader using our link to get it for just £25 + VAT. Create your iZettle account via the website and connect your bank account. Download the official iZettle app for Android or Apple. Connect your card reader to your app via Bluetooth.